Receiving the appropriate amount of Vitamin D is essential to your overall health. The vitamin gives your body the means necessary to absorb calcium, promote bone growth, and generate healthy muscles. Lacking the proper amount of Vitamin D can put children at risk of rickets, or soft bones, and adults can become prone to osteomalacia, or misshapen bones. Because of the potential implications this vitamin can have over your life and health, it’s crucial for you to acknowledge healthy ways to absorb Vitamin D.
Vitamin D is a group of fat-soluble secosteroids. This specific group is responsible for enhancing intestinal absorption of calcium, iron, magnesium, phosphate, and zinc. Working to protect your muscles, heart, lungs, and brain, your body wouldn’t be able to perform at its best without Vitamin D.
Your body absorbs Vitamin D after going through several steps. Only after these steps take place can the vitamin provide your body with all of its health benefits. The first step is for your body to be exposed to Vitamin D. And what’s important to note here is that Vitamin D isn’t like any other vitamin in terms of production. Vitamin D is the only vitamin that’s produced by your body naturally, meaning that although you can receive Vitamin D outside of your body with vitamin supplements and food, your body is the main production source of Vitamin D.
Your body produces Vitamin D through mild sun exposure. After being exposed to the sun, your body goes through a number of chemical processes to transform the sun’s ultraviolet (UV) rays into the appropriate form of Vitamin D for your body’s use. First, Vitamin D is sent to your liver. From there, your liver changes the vitamin into a substance called Calcifediol, or 25(OH)D. Calcifediol is a prehormone, a biochemical substance secreted by glandular tissue that’s used to determine a patient’s level of Vitamin D. So when your doctor discusses your Vitamin D levels, they’re referring to the amount of Calcifediol present in your blood. Once Vitamin D is in the form of 25(OH)D, its sent throughout your body where various tissues work to turn Calcifediol into activated Vitamin D. During this step, your body receives the full health benefits including managing the calcium in your blood, gut, and bones, and helping your cells communicate properly. What are safe ways to get Vitamin D? Vitamin D is crucial to your overall health, so it’s important to be exposed to the vitamin on a daily basis. However, when being exposed to Vitamin D, it’s vital to do so in a healthy, effective way; as to not counteract the benefits and cause harm to your health. At Arizona Dermatology, we’re aware of the negative impact sunlight has on our patients’ bodies. Too much exposure to ultraviolet (UV) rays causes permanent damage to the skin and greatly increases the chance of skin cancer. However, sunlight is also the main natural source of Vitamin D. This leaves many questioning the balance between staying out of the sun to reduce the risk of skin cancer, and staying in the sun to absorb an appropriate amount of Vitamin D.
It’s our professional recommendation to continue to wear sunblock, stay away from sunbathing and indoor tanning, and wear protective clothing to reduce the risk of sunburns. However, we do recommend mildly exposing yourself to the sun to avoid Vitamin D deficiency. This doesn’t mean we’re suggesting tanning of any kind, but rather encouraging you to enjoy the outdoors two to three times a week using proper sun protection measures. WebMD supports this claim and suggests that individuals remain in the sunlight for about one-fourth of the time it would take to develop a mild sunburn. This gives your skin an optimal amount of time to produce Vitamin D, while still reducing your risk of skin cancer. For more details on the potential implications sunlight can have on your overall health, set up a consultation appointment with one of our top doctors. Another effective and safe way to receive Vitamin D is to take vitamin supplements. However, to get the most benefit out of a Vitamin D supplement, your body must have other cofactors present. 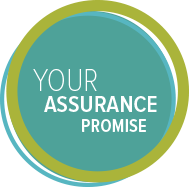 We recommend consulting your doctor to determine an appropriate dosage for your specific needs. Food is another healthy alternative for receiving Vitamin D. For patients looking to increase their Vitamin D levels, we recommend selecting animal-based foods. Animal-based foods are natural, safe, and typically rich in Vitamin D.
When it comes to food, it’s important to note that most patients don’t receive the appropriate dosage of Vitamin D strictly from food itself. In most cases, we suggest using food in conjunction to supplements and sunlight to maintain the proper amount of Vitamin D.
Like most other vitamins, how much Vitamin D you need on a daily basis is measured in international units (IU). IUs are used for the purpose of measuring the intake of specific drugs and vitamins. When a vitamin produces a particular biological effect, the supplement is noted as an international standard and is measured IUs. 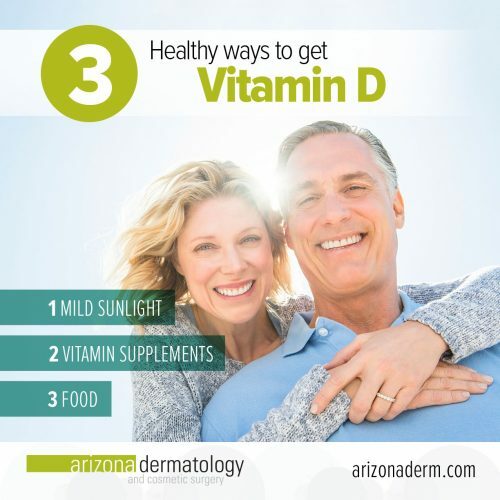 At Arizona Dermatology, we recommend that our adult patients take Vitamin D3 with a daily intake of 2000 IU. However, if you are deficient in Vitamin D, we recommend consulting your doctor. Depending on your specific case, you may need to increase your daily intake. If you have any further questions, comments, or concerns about receiving Vitamin D, give us a call. Our patients are our top priority. We’re here to help you determine the appropriate parameters of sunlight and Vitamin D, so your skin and body remains in good health.